In Sony's Founding Prospectus, co-founder Masaru Ibuka set "contributing to Japanese culture through technology" and "the promotion of education in science among the general public" as primary goals. Sony has focused on science education for children, who will shape the next generation. In keeping with Ibuka's vision, Sony continues to implement activities designed to contribute to society. Following the course set by Sony co-founder Masaru Ibuka, activities are adapted to meet current and local needs in helping to solve the various issues facing regions where Sony operates around the world. Putting its "For the Next Generation" CSR philosophy into action, Sony makes the most of its unique technological and service assets in the areas in which it is particularly strong. Recognizing the affinity of this approach with the UN Sustainable Development Goals, Sony aims to contribute to the resolution of a wide range of global social issues through tapping into the power of entertainment and applying its technologies, for example, supporting education in countries and regions throughout the world, and emergency relief in response to major disasters. In addition to global projects, which are spearheaded by Sony Corporation, Sony Group companies worldwide and the Group's five foundations cooperate with stakeholders such as international organizations and NGOs to promote initiatives tailored to local needs. Sony encourages employees to play an active role in these types of activities, as well. Community engagement expenditures were 2.3 billion yen. 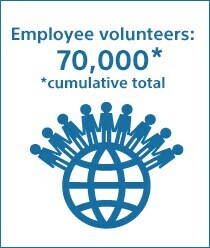 A total of 70,000 employees took part in Sony's global in-house volunteer program known as "SOMEONE NEEDS YOU." Sony Science Program workshops were held approximately 90 times, attracting 3,000 participants. The Sony Foundation Australia assisted teenagers and young adults who are battling cancer. Sony will continue to make the most of its products, technologies, services, innovations, the capabilities of Sony Group employees, and its partnership with stakeholders to address various social needs. As part of this effort, Sony will also be working to help achieve the Sustainable Development Goals (SDGs), particularly those which are related to Sony's community engagement.